These are my reviews of art exhibitions and plays, for History Today, the Periscope Post and Cherwell, plus a write-up of my adventure as a publicist for comedy duo The Ambassadors at the Edinburgh Festival in 2004. 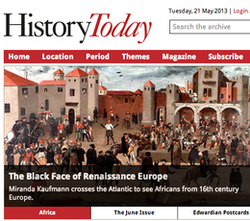 The Black Face of Renaissance Europe, History Today, 21st May 2013. In the case of Giulia de’ Medici, the African presence was literally painted out of European history for almost four hundred years. The granddaughter of an enslaved African woman named Simonetta, Giulia was portrayed by Jacopo Pontormo in 1539 with her guardian, Maria Salviati. Her father, Alessandro de’ Medici, Duke of Florence, had been assassinated two years before. At some point in the following century, her image was painted over. The child uncovered during cleaning in 1937 was only identified as Giulia in 1992. Pontormo’s portrait is thus the earliest of a child of African descent in Europe, and became the inspiration for this exhibition, which includes those of African descent, like Giulia, in its definition of “African”. Tina Benko and Rokia Traore perform Desdemona. Writer Toni Morrison, director Peter Sellars, and singer-songwriter Rokia Traoré breathe new life into Shakespeare’s Desdemona. From these few lines of Shakespeare, Nobel laureate Toni Morrison, director Peter Sellars, and Malian signer-songwriter Rokia Traore have fashioned a mesmeric performance piece which blends the music of Mali with the haunted words of Desdemona from beyond the grave. Desdemona, which played only two nights at the Barbican, offers a depth to the doomed bride and transforms the story of jealousy into a different kind of tale altogether. Complicite’s compelling, confusing The Master and Margarita makes Miranda Kaufmann just want to go back to the book. Patriarch’s Ponds in Moscow was named in honour of the Patriarch of the Russian Orthodox Church. Which makes it a strange place to encounter the Devil. But then perhaps Berlioz, the atheist literary editor in The Master and Margarita, invited him there, when he wonders whether it’s time “to throw everything to the Devil”? For it is as he utters this thought that the compelling stranger, tall and pale, dressed all in black with dark glasses, and a beret, a terrifying glint to his teeth, materialises out of the hot spring air. After he accurately predicts that Berlioz will shortly be decapitated by a streetcar, we are glued to his every move, keen to learn what new disaster he will perpetrate. The Edinburgh Festival Unwrapped, Cherwell, 6 October 2004, pp. 12-13. On my first night in Edinburgh I watched a guy I knew from college successfully climb a traffic light. He sat on top of it for a good five minutes. My feeling on first inhaling the festival-tinged air that this was a time and place where anything could happen seemed to be confirmed. The town was buzzing. Staying up all night. Its sun was shining, and I felt royal walking down the Mile. The circus had come to town. There were 1,700 shows to choose from. It was a lucky dip, but at £7 a go, you had to try to make an informed decision. Unfortunately, it would take at least a day to read through the entire programme. Fortunately, I had a free pass to all Gilded Balloon shows. Caught Red Handed, Cherwell, June 2003.
Review of: Tom Philips and Richard Wentworth, 'Red Handed (With Lucy)' The Christ Church Picture Gallery, Oxford, 14 May to 27 July 2003. Lucy isn't a girl. She used to be a factory near Port Meadow where Tom Philips collected pieces of scrap iron on weekend walks. 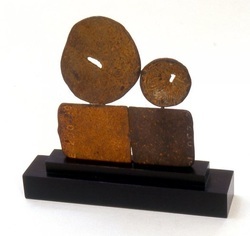 He had forged them into a series of imaginary shrines, such as Duet (pictured). I suppose he got red handed when he used blood in creating Dada Ernst: Hair, blood and earth spell out german phrases. It could be yours for £11,500. All the pieces here are on sale. If I had the money, I'd go for the Arcrylic cube with Silkscreen Phillips madein 1999. Entitled "Wittgenstein's Dilemma",the words "THE LIMITS OF MY LANGUAGE ARE THE LIMITS OF MY WORLD", are imprisoned by the physical limits of the cube's rigid form. Also of note are the words screens Philips has fashioned out of iron. Hung against a window, silouetted by the sun, are wire words strung together. The Calligrapher Replies (1996) is the larger of two works, and the curved letters morph into one another beautifully. By it's side is the Love Song of William Toge (1998): "TOGE AND AMOUR HERE COMES THE PAST AT LAST GO INTO THE WORLD TOGE SING OUR TIMES AND SEASONS..." Beautiful phrases stand out: "NEW TO HAPPINESS MOVED TO SPARKLE SEE THE PETALS PALPITATE LIKE THE WINGS OF HER REAL SELF OPENING" and"YOU STIR THE VIOLET NOTES AND KNOW THE PURPLE QUESTIONS ENTER THE EVENING". I'd like to have it hanging in my window, and gaze at it often, making out the words slowly. This exhibition's made me go all poetic...Alongside Phillips work is displayed a series on Wentworth's photos, taken around Oxford. A bargain at £5000 each! He says he's trying to answer the question "do cities belong to us or do we belong to them?" I'm not sure he's answered that, but he provides a series of striking and thought provoking images. The one I had to ponder the longest had a framed picture of the queen flanked by candles, and prints of Miro's Blue II and Rothko's Red White and Brown. Behind the picture frame was a vase of red and white carnations, some drooping. It seemed to be a shrine-perhaps tihs idea was suggested by the context of Phillips' work. But another image confirmed my impression. A billboard on Crown Street (no coincidence) was advertising Orange: "I know the latest news", Graffitti responded :"The Queen is dead! Jubilee cancelled." I wondered how contrived these images were? Go see for yourself. Going Back to the Classics, Cherwell, 9 May 2003, p. 8. This week visual arts in Oxford was nowhere near boiling-point. The new exhibitions in the Ashmolean such as Spectacular Impressions and An Englishman’s Travels in Egypt, despite their promising titles, were more lukewarm than usual. The former, showcasing prints from the 15th to 17th centuries by artists such as Mantegna, Durer, Rembrandt and Van Dyck, was definitely enlightening. Every one of the images on display has been recognised internationally as to be of the highest quality, and each could probably inspire an exhibition in itself. However, to the untrained and uninformed eye, they were impressive more in terms of technical skill than emotive power. Similarly, the Englishman’s Travels in Europe though interesting in its revival of the story of Edward Lane, a renowned Arabic scholar and fine draughtsman, invited only a passing glance. In the same way, Ornamentation: drawings for the decorative arts, running in the Christ Church Gallery from 30 April to 30 July, seemed to me to be pleasant but entirely insipid, drawing on the College’s existing collection of graphic art and featuring particularly prominently the designs of Giulio Romano. Apart from a slight physical resemblance to Punch cartoons, the collection was unremarkable, offering plenty of faint drawings of ornamental vases, curlicues and seals.